NIH Study demonstrates NOVA qMRA® is a robust, independent predictor of recurrent stroke. NOVA® quantifies the blood flow in vessels using standard MRI scanning. 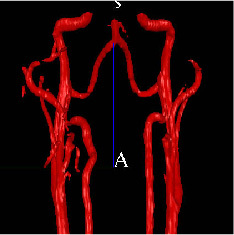 NOVA is a flow analysis system that works with Time-of-Flight MRA and 2D phase-contrast magnetic resonance imaging to produce a 3D model of the vasculature and quantify vessel blood flow. The NOVA 3D model rotates a full 360°, allowing the anatomy to be viewed from all angles. The NOVA report shows volumetric flow rates, velocity, waveforms and flow direction. What is NOVA?…..How does it work? NOVA-Neuro is the first commercially available software to use a 3D Model based approach for MR flow measurement. 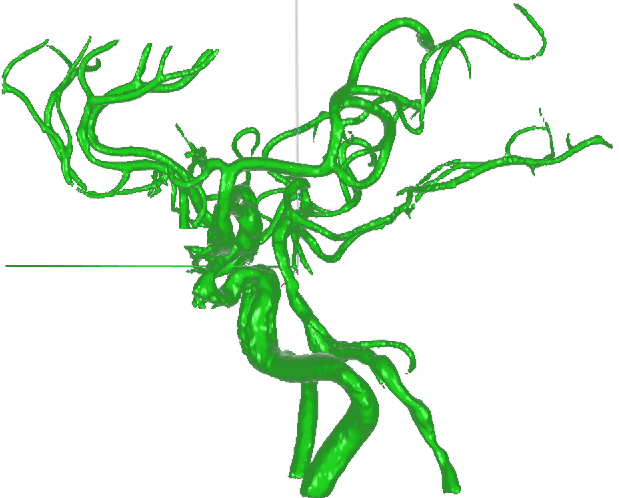 NOVA produces a 3D model of the patient’s blood vessels from the Time-of-Flight MRA images. The 3D model is indispensable for planning the 2D phase-contrast flow quantification scans that follow. 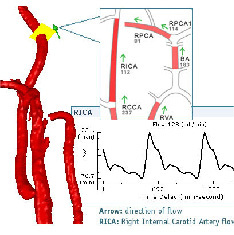 Using the rotational 3D navigation tools, the operator can rapidly identify the arteries or veins, and with NOVA’s patented algorithms, automatically prescribe perpendicular scan planes to individual vessels. NOVA’s stream-lined, time saving approach insures accurate flow measurements and a complete evaluation of the Head and Neck within the span of the TOF MRA exam. Every year, over 900,000 Americans experience a stroke or transient ischemic attack (TIA) caused by insufficient blood flow to the brain. Known as an ischemic stroke, it is the most common type of stroke. The high risk of recurrence in stroke survivors contributes to the enormous morbidity of this major public health concern, the leading cause of disability in the U.S.
NOVA quantitative MRA gives stroke specialists a powerful diagnostic tool to quantify cerebral hemodynamics and to help assess their patients’ risk of stroke. They got a gift back! 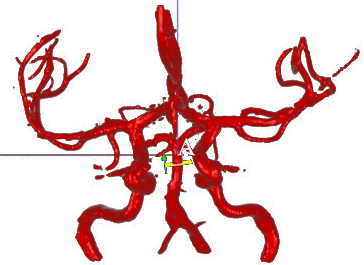 Sam Hachem had a 98% blocked Basilar Artery that was treated with a Basilar Artery Stent. Before the invention of NOVA software, the only way to check the patency of this stent was via sending a contrast agent through the cerebrovascular system, performing an invasive angiogram and viewing the stent through radioactive fluoroscopy. As Sam’s physician, Dr. Matthew Berlet at Tampa’s St. Joseph hospital says, the follow up treatment itself creates a “significant risk of stroke”. But Dr. Berlet had another idea. 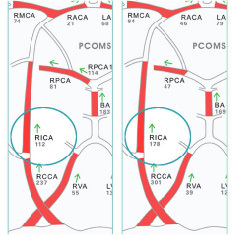 He sent Sam, and Sam’s wife Laurice, to Chicago – to have a NOVA study determine whether Sam was receiving viable blood flow through his basilar artery stent. The NOVA test, available at the University of Illinois at Chicago (UIC) was non-invasive, and did not require either contrast agent or radiation. In Sam’s case the test determined that there was indeed adequate blood flow. Better yet, the UIC staff told Sam and Laurice that they could check the patency of Sam’s stent on a regular basis using only the NOVA software. Sam and Laurice were so thrilled, they donated the NOVA software to St. Joseph’s hospital where Dr. Berlet is able to use it to diagnose, plan treatment and follow up on other patients with many forms of cerebrovascular disease. Sam Hachem volunteered to be the first test patient on the new NOVA system in Tampa. Shockingly, although only a system test, the doctors found that Sam was bleeding into the brain. This impromptu NOVA exam once again saved Sam’s life.